I wonder if my class’ reunion will be anything like the reunion that’s currently on the big screen in the movie 10 Years. Unlike other films, like American Reunion, that have dramatized high school reunions and played them for laughs, this one plays it mostly straight, letting the viewer act as a fly on the wall as a group of friends come together, seemingly for the first time, at their high-school reunion a decade after graduation. 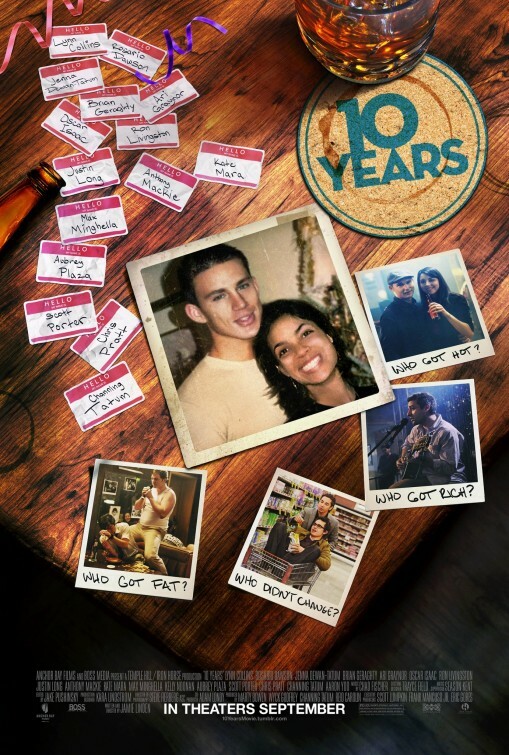 The characters include Jake (Channing Tatum, in his fifth movie this year), the prom king still carrying around feelings for his ex-girlfriend (Rosario Dawson), even though he’s about to propose to his longtime girlfriend (Channing’s real-life wife, Jenna Dewan Tatum); Reeves (Oscar Isaac), the singer/songwriter who’s gone on to have a hit single; Cully (Chris Pratt), the former jock bully; Elise (Kate Mara), whose quiet presence barely made an impact on any of her classmates; Anna (Lynne Collins), the former party girl; and Garrity (Brian Geraghty), the white guy who used to hang with the black kids. Lots of clichés are here: Cully wants to apologize to the people he was mean to as a kid, Elise learns she wasn’t as overlooked as she thought, people lie about their current lifestyles, others haven’t grown up as much as they think they have, and more. Basically, every character in 10 Years is carrying around his or her own form of unresolved issues. The present isn’t necessarily better than the past was, and some characters learn that no form of embarrassment hurts more than when the people who knew you in high school see right through your lies. The message of this sweet and surprisingly good movie is clear: You can hide from lots of people, but you can’t hide from the people who know — or knew — you best. And it’s only when you can truly close the book on one chapter of your life that you can really move forward. Writer/director Jamie Linden (whose credits include the screenplay of We Are Marshall) balances the action across the various characters and storylines well, giving equal attention to everyone and letting the action unfold naturally. Whether my own upcoming reunion will be as dramatic or revealing as the one in 10 Years is remains to be seen. (I’m guessing no.) But among its redeeming qualities, the movie does one thing well: It makes me look forward even more to seeing my old friends this November. I’m giving 10 Years a B+. How much have you changed since high school? Share your thoughts in the comments section below.